A Lutheran Mass consists of just the Kyrie and Gloria, which were still sung in Latin more than a century after the Reformation began. (The Credo was sung in German and the last two movements were optional parts of the service.) Bach wrote five settings, but the Missa 1733 eventually gained the rest of its movements to become the Mass in B Minor. 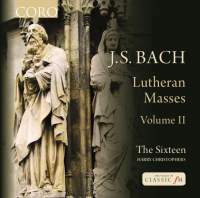 The other four have now been recorded by The Sixteen, though I have not received the other disc containing BWV 233, 235, and another cantata (BWV 102). Cantata 79 was chosen for inclusion because each of these Masses includes one movement that is a parody of the cantata, the “Gloria” of BWV 236 and the “Quoniam” of BWV 234. In fact, 20 of the 24 movements of the four Masses have been drawn from cantatas, reworked in various degrees. In each case the Gloria is divided into five movements with choruses framing the three inner movements. The Masses have not been regarded favorably by commentators, who seem to prefer the music in its original form as cantata movements, and Christophers calls them “seldom heard.” Perhaps they are not often heard in concert, but the “Qui tollis” from BWV 234 was recorded (twice) in the shellac era, and Hans Grischkat recorded an integral set of the four Masses in the earliest days of LP (he added the four settings of the Sanctus, BWV 237 to 240). Beginning around 1970 more sets began to arrive from Helmuth Rilling, Michel Corboz, Martin Flämig, Richard Hickox, and Hans-Martin Linde. After that I lost track, but sets have been more common than recordings of single Masses. The performances are up to the ensemble’s expected high level. The group, always flexible in makeup, consists here of eight singers and an ensemble of 22 players. The cantata, written for Reformation Sunday of 1725 (the composer’s third cycle of cantatas), is especially well done. It is nice to hear the Mass movement that was singled out in the shellac era, a soprano solo with flute obbligato. The long lines require a voice capable of a sustained legato line, elegantly realized here by Julia Doyle. This is characteristic of the high level that Christophers has brought to this endeavor. I cannot compare this with the competition, but it can stand on its own for a favorable recommendation.